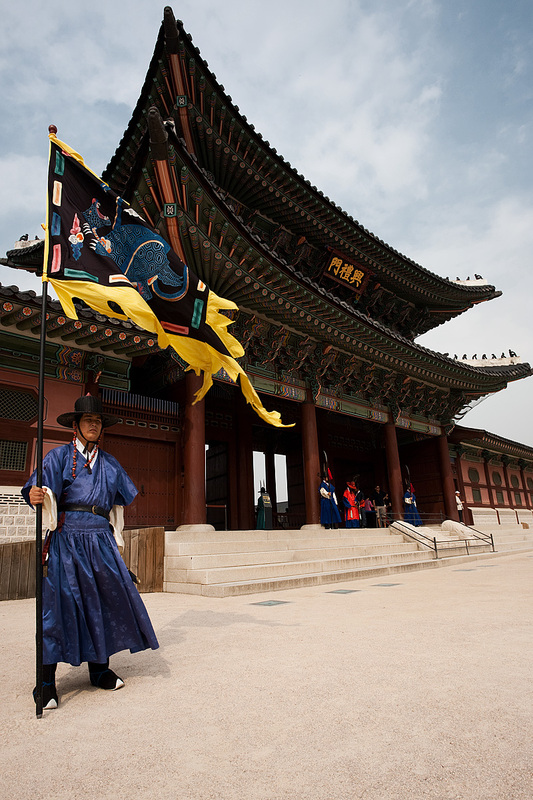 A guard carrying the royal flag stands aside the main entrance to Gyeongbokgung Palace. Multiple times each day, there is what appears to be a changing of the guards ceremony at the main entrance to Gyeongbokgung Palace much like the changing of the guards at Deoksugung Palace. It's tough to get a clean shot with so many foreign tourists sporting unappealing shorts mucking up the background but I managed to sneak one while the coast was clear. Unfortunately, there's one foreigner that snuck past my bad-shorts filter and although not pictured, he's wearing that dreaded "Look, I'm a tourist" strappy sandals and brown cargo shorts combination. Once I become an adult and have children, I'll earn the right of passage to wear terrible shorts and strappy sandals but until then, I'll try to stay hip on the latest fashion trends. 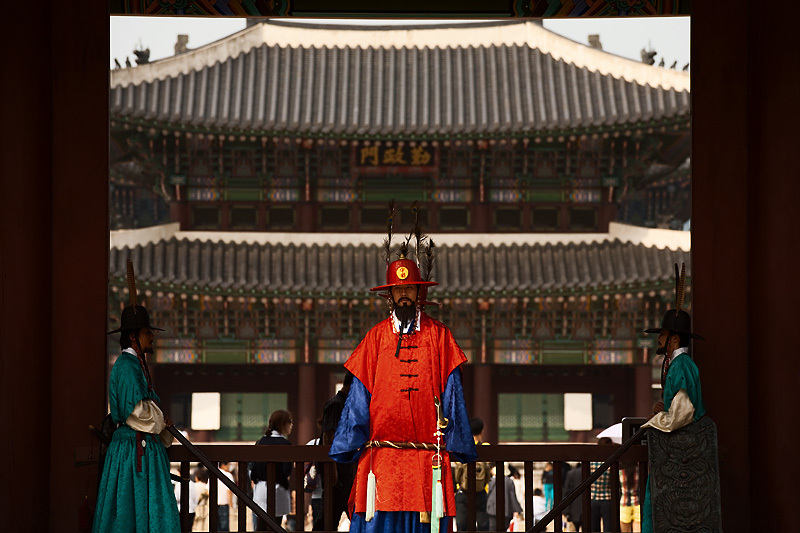 The head guard backed by the inner architecture of Gyeongbokgung Palace. This must be their day jobs. Upon closer inspection, you'd be able to see their temporarily glued-on facial hair. Unless these Koreans, like me, are born without the ability to grow a beard or mustache. I know your pain, my friends. i would like a digital copy of the first pic up above. please let me know your thoughts on this. i would like to use it as a background image for a pic of a korean friend of mine.